You’ve probably noticed the huge hotel that has spring up close to UTC in town with the umbrella things on the roof. First it was called Zinc Hotel then it mysteriously changed names to Ubumwe Grande after some issues with the owners. Or so I’m told. For such an impressive building they should probably do something about their tacky sign out on the street corner but I suppose that might not be on the top of their priority list. So far I’ve been to Ubumwe Grande a few times for lunch and a couple of times for drinks in the evening and I’ve been impressed each time. I really like this place though I’m always surprised to see how empty it is during the day, especially given that the food is quite good and comes out pretty quickly. Plus the Internet here is fast and it’s become one of my favourite places to come to get work done… Kigali’s best kept Internet secret, perhaps? The rooftop pool never has anyone in it and the lounge chairs are a nice, quiet spot for kicking back to read or get some work done in between being distracted by the view. The pool itself is only for guests, though. Ubumwe Grande has quite a few interesting dishes on offer (pressed goat terrine or smoked salmon with Waldorf salad, anyone?) with prices a bit higher than your average cafe, but servings are large and I’ve been happy with every dish I’ve ordered there so far. I came here very soon after thy opened and tried the lamb stew (Rwf 7,200) and was very impressed. Total cozy comfort food. The meal is large and could easily be shared. Unfortunately the stew took over an hour to be served but I’ll chalk that up to first-week opening issues and since then everything I’ve ordered has been served pretty quickly. The menu at Ubumwe Grande doesn’t seem to have so many light lunch options with only one salad and a few sandwiches and burgers to choose from. I was, however, really impressed with the tuna sandwich (Rwf 6,500) and might even go so far to say that it’s the best in Kigali. At Rwf 6,500 for a freaking tuna sandwich, though, you’d expect it to be good! But it is a triple-decker and it’s served with a good helping of fries which means it would be good for sharing with a buddy if neither of you were super hungry. The steak sandwich Rwf (Rwf 7,000) was also impressive though they forgot to put blue cheese on mine which caused me extreme food-related sadness. The chicken club (Rwf 7,000) is quite good as well. I like how it’s not heavy on the bread… the toasted slices are nice and thin and it makes for a good bread/filling ratio. Because ratio is important, after all. Sure, the sandwiches are pretty expensive but they really are quite good and I’d say worth it, especially since the meal is very filling. As a bonus, the fries here are some of my favourite in Kigali though it’s too bad that they don’t have proper, homemade pili pili. Akabanga I love you, but it just isn’t the same. The thing that Ubumwe Grande has above all other restaurants in the city is the view. True, there are many places around Kigali with fantastic views but it’s hard to beat a restaurant atop a 12 story hotel perched on one of the highest hills in the city. The hotel has a view across most of Kigali and it’s a perfect first stop for new arrivals to get their bearings from above. Grab a map of Kigali, stop by for lunch or a drink, and look out over the city while trying to see how Kigali fits together. It’s great during the day but stunning also at night. On a clear night Kigali City Tower reflects the starry sky making it seem almost transparent which is very cool looking. Ubumwe Grande seems like it would be a pretty expensive place for drinks given that it’s a nice hotel. Surprisingly, booze here is reasonably priced with cocktails ranging from between Rwf 5,000 and 6,500 and spirits starting at Rwf 2,500 and going up from there. The beer is weirdly pricey though with a Heinekin costing an offensive Rwf 4,000 and wine starts at Rwf 5,000 per glass or upwards from Rwf 27,000 for a bottle. They have the usual selection of tea and coffee though a regular coffee costs Rwf 3,000 and an Irish coffee is just Rwf 1,000 more. So if daytime drinking (disguised as coffee) is your thing then this is your place. I, of course, would never encourage such behaviour. Ubumwe Grande seems to be a meat and potatoes type place with only one salad to choose from. Luckily it’s a Greek salad (Rwf 5,500) and I’m a sucker for feta so I thought I’d give it a try. Sadly, it wasn’t quite what I was expecting. It was quite difficult to eat with shredded carrots (yes, carrots! They have no place in a Greek salad…) and thin rings of onion that sort of turned it into a nest of entangled veggie elements that all come at your face attached to each other. The feta isn’t great but at least it isn’t gouda as with most faux Greek salads found around Kigali. They kind of skimp on the cheese, tomatoes, and cucumbers but the olives are nice which makes up for it a bit. This certainly isn’t a classic Greek salad but it’s a decent salad nonetheless. One thing that they could certainly work on is the service. Wait staff here are pretty inattentive which is quite amazing since there always seems to be five or six people working and very few customers. I’ve never had anyone come to check on me without first having to wave my arms or go up to get them at the bar. They’re very sweet but you can tell that many of them are new to serving. But I can say that they do a good job once you actually get their attention and I’ve always had a good experience here. I really like Ubumwe Grande. I like that it’s close to my house, I love the view, I really like the interesting options on the menu, and I really really like the reliable, fast Internet (because attempting to use Airtel at my house lately makes me want to stab my eyes out). Have you tried this place yet? What do you think? Leave a comment below! Wish someone at Ubumwe can explain to me why the ridiculously high prices for Beer…. I mean 2,500 for a skol and 4,000 for a heineken. I have been to many very nice place in Kigali but never seen such prices. Maybe they are trying to attract a certain clientele but no need to go that high. No wonder that place is always empty. we have since reduced our Menu prices, come check them out. I liked the place but the service is a bit down. Also how do they seek marketing by enticing people to share photos from their rooftop in order to get a free meal and what not and yet they know they WON’T!! Its just wrong and gross for such a hotel. Hi Gee, we have rectified that. You are most welcome. I visited it before opening and was impressed. They need to do good marketing to pull the crowd. As mentioned by the writer above that not only the food is good, but the prices are very attractive, then it should be a must visit for most of us. Good luck everybody. I will be in Kigali in Dec. I am presently based in Goma. So any queries related to Goma and Gisenyi are welcome. We are the biggest travel and tour operators of Congo. 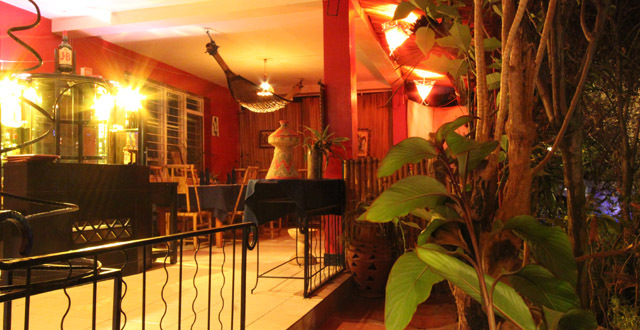 This is one of the most wonderful places in Kigali that anyone has to try out… I fell in love with it on the very first day. The view is breathtaking and so beautiful. Don’t limit your self, come check it out.